Not to be confused with methanol or methanal. Menthol is an organic compound made synthetically or obtained from the oils of corn mint, peppermint, or other mints. It is a waxy, crystalline substance, clear or white in color, which is solid at room temperature and melts slightly above. The main form of menthol occurring in nature is (−)-menthol, which is assigned the (1R,2S,5R) configuration. Menthol has local anesthetic and counterirritant qualities, and it is widely used to relieve minor throat irritation. Menthol also acts as a weak kappa opioid receptor agonist. The (+)- and (–)-enantiomers of menthol are the most stable among these based on their cyclohexane conformations. With the ring itself in a chair conformation, all three bulky groups can orient in equatorial positions. The two crystal forms for racemic menthol have melting points of 28 °C and 38 °C. Pure (−)-menthol has four crystal forms, of which the most stable is the α form, the familiar broad needles. 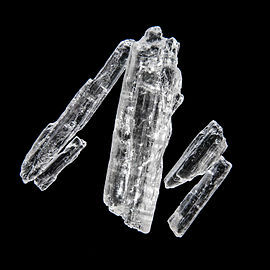 Menthol crystals at room temperature. Approx. 1 cm in length. Menthol's ability to chemically trigger the cold-sensitive TRPM8 receptors in the skin is responsible for the well-known cooling sensation it provokes when inhaled, eaten, or applied to the skin. In this sense, it is similar to capsaicin, the chemical responsible for the spiciness of hot chilis (which stimulates heat sensors, also without causing an actual change in temperature). Menthol's analgesic properties are mediated through a selective activation of κ-opioid receptors. Menthol also blocks voltage-sensitive sodium channels, reducing neural activity that may stimulate muscles. A study showed that topical absorption of ibuprofen is not increased by menthol, but does note the complementary effect of the menthol as a pain reliever itself. Some studies show that menthol acts as GABAA receptor positive allosteric modulator and increases GABAergic transmission in PAG neurons. Menthol also shares anaesthetic properties similar to propofol, by modulating the same sites of the GABAA receptor. Menthol is widely used in dental care as a topical antibacterial agent, effective against several types of streptococci and lactobacilli. Mentha arvensis (wild mint) is the primary species of mint used to make natural menthol crystals and natural menthol flakes. This species is primarily grown in the Uttar Pradesh region in India. Menthol occurs naturally in peppermint oil (along with a little menthone, the ester menthyl acetate and other compounds), obtained from Mentha × piperita (peppermint). Japanese menthol also contains a small percentage of the 1-epimer, neomenthol. The biosynthesis of menthol has been investigated in Mentha × piperita and the enzymes involved in have been identified and characterized. It begins with the synthesis of the terpene limonene, followed by hydroxylation, and then several reduction and isomerization steps. More specifically, the biosynthesis of (−)-menthol takes place in the secretory gland cells of the peppermint plant. Geranyl diphosphate synthase (GPPS), first catalyzes the reaction of IPP and DMAPP into geranyl diphosphate. Next (−)-limonene synthase (LS) catalyzes the cyclization of geranyl diphosphate to (−)-limonene. (−)-Limonene-3-hydroxylase (L3OH), using O2 and NADPH, then catalyzes the allylic hydroxylation of (−)-limonene at the 3 position to (−)-trans-isopiperitenol. (−)-trans-Isopiperitenol dehydrogenase (iPD) further oxidizes the hydroxyl group on the 3 position using NAD+ to make (−)-isopiperitenone. (−)-Isopiperitenone reductase (iPR) then reduces the double bond between carbons 1 and 2 using NADPH to form (+)-cis-isopulegone. (+)-cis-Isopulegone isomerase (iPI) then isomerizes the remaining double bond to form (+)-pulegone. (+)-Pulegone reductase (PR) then reduces this double bond using NADPH to form (−)-menthone. (−)-Menthone reductase (MR) then reduces the carbonyl group using NADPH to form (−)-menthol. Natural menthol is obtained by freezing peppermint oil. The resultant crystals of menthol are then separated by filtration. Total world production of menthol in 1998 was 12,000 tonnes of which 2,500 tonnes was synthetic. In 2005, the annual production of synthetic menthol was almost double. Prices are in the $10–20/kg range with peaks in the $40/kg region but have reached as high as $100/kg. In 1985, it was estimated that China produced most of the world's supply of natural menthol, although it appears that India has pushed China into second place. The process begins by forming an allylic amine from myrcene, which undergoes asymmetric isomerisation in the presence of a BINAP rhodium complex to give (after hydrolysis) enantiomerically pure R-citronellal. This is cyclised by a carbonyl-ene-reaction initiated by zinc bromide to isopulegol, which is then hydrogenated to give pure (1R,2S,5R)-menthol. Another commercial process is the Haarmann–Reimer process (after the company Haarmann & Reimer, now part of Symrise) This process starts from m-cresol which is alkylated with propene to thymol. This compound is hydrogenated in the next step. Racemic menthol is isolated by fractional distillation. The enantiomers are separated by chiral resolution in reaction with methyl benzoate, selective crystallisation followed by hydrolysis. Racemic menthol can also be formed by hydrogenation of pulegone. In both cases with further processing (crystallizative entrainment resolution of the menthyl benzoate conglomerate) it is possible to concentrate the L-enantiomer, however this tends to be less efficient, although the higher processing costs may be offset by lower raw material costs. A further advantage of this process is that D-menthol becomes inexpensively available for use as a chiral auxiliary, along with the more usual L-antipode. In nonprescription products for short-term relief of minor sore throat and minor mouth or throat irritation. Examples: lip balms and cough medicines. As an antipruritic to reduce itching. As a topical analgesic, it is used to relieve minor aches and pains, such as muscle cramps, sprains, headaches and similar conditions, alone or combined with chemicals such as camphor, eucalyptus oil or capsaicin. In Europe, it tends to appear as a gel or a cream, while in the U.S., patches and body sleeves are very frequently used. Examples: Tiger Balm, or IcyHot patches or knee/elbow sleeves. As a penetration enhancer in transdermal drug delivery. In decongestants for chest and sinuses (cream, patch or nose inhaler). Examples: Vicks VapoRub, Mentholatum, VapoRem. In certain medications used to treat sunburns, as it provides a cooling sensation (then often associated with aloe). In aftershave products to relieve razor burn. As a smoking tobacco additive in some cigarette brands, for flavor, and to reduce throat and sinus irritation caused by smoking. Menthol also increases nicotine receptor density, increasing the addictive potential of tobacco products. Commonly used in oral hygiene products and bad-breath remedies, such as mouthwash, toothpaste, mouth and tongue sprays, and more generally as a food flavor agent; such as in chewing gum and candy. As a pesticide against tracheal mites of honey bees. In perfumery, menthol is used to prepare menthyl esters to emphasize floral notes (especially rose). In first aid products such as "mineral ice" to produce a cooling effect as a substitute for real ice in the absence of water or electricity (pouch, body patch/sleeve or cream). In various patches ranging from fever-reducing patches applied to children's foreheads to "foot patches" to relieve numerous ailments (the latter being much more frequent and elaborate in Asia, especially Japan: some varieties use "functional protrusions", or small bumps to massage one's feet as well as soothing them and cooling them down). In some beauty products such as hair conditioners, based on natural ingredients (e.g., St. Ives). As an antispasmodic and smooth muscle relaxant in upper gastrointestinal endoscopy. In organic chemistry, menthol is used as a chiral auxiliary in asymmetric synthesis. For example, sulfinate esters made from sulfinyl chlorides and menthol can be used to make enantiomerically pure sulfoxides by reaction with organolithium reagents or Grignard reagents. 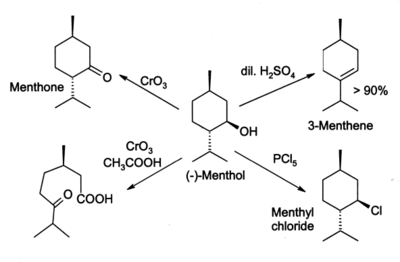 Menthol reacts with chiral carboxylic acids to give diastereomic menthyl esters, which are useful for chiral resolution. Menthol reacts in many ways like a normal secondary alcohol. It is oxidised to menthone by oxidising agents such as chromic acid or dichromate, though under some conditions the oxidation can go further and break open the ring. Menthol is easily dehydrated to give mainly 3-menthene, by the action of 2% sulfuric acid. Phosphorus pentachloride (PCl5) gives menthyl chloride. In the West, menthol was first isolated in 1771, by Hieronymus David Gaubius. Early characterizations were done by Oppenheim, Beckett, Moriya, and Atkinson. It was named by F. L. Alphons Oppenheim (1833–1877) in 1861. The estimated lethal dose for menthol (and peppermint oil) in humans may be as low as 50–500 mg/kg, (LD50 Acute: 3300 mg/kg [Rat]. 3400 mg/kg [Mouse]. 800 mg/kg [Cat]). Survival after doses of 8 to 9 g have been reported. Overdose effects are abdominal pain, ataxia, atrial fibrillation, bradycardia, coma, dizziness, lethargy, nausea, skin rash, tremor, vomiting, vertigo. ^ "Safety Data Sheet" (PDF). Reckitt Benckiser. 27 October 2016. Retrieved 3 August 2018. ^ Eccles, R. (1994). "Menthol and Related Cooling Compounds". J. Pharm. Pharmacol. 46 (8): 618–630. doi:10.1111/j.2042-7158.1994.tb03871.x. PMID 7529306. ^ Galeotti, N.; Mannelli, L. D. C.; Mazzanti, G.; Bartolini, A.; Ghelardini, C.; Di Cesare, Mannelli (2002). "Menthol: a natural analgesic compound". Neurosci. Lett. 322 (3): 145–148. doi:10.1016/S0304-3940(01)02527-7. PMID 11897159. ^ Haeseler, G.; Maue, D.; Grosskreutz, J.; Bufler, J.; Nentwig, B.; Piepenbrock, S.; Dengler, R.; Leuwer, M. (2002). "Voltage-dependent block of neuronal and skeletal muscle sodium channels by thymol and menthol". Eur. J. Anaesthes. 19 (8): 571–579. doi:10.1017/S0265021502000923. ^ Brain, K. R.; Green, D. M.; Dykes, P. J.; Marks, R.; Bola, T. S. (2006). "The role of menthol in skin penetration from topical formulations of ibuprofen 5% in vivo". Skin Pharmacol. Physiol. 19 (1): 17–21. doi:10.1159/000089139. PMID 16247245. ^ Lau, Benjamin K.; Karim, Shafinaz; Goodchild, Ann K.; Vaughan, Christopher W.; Drew, Geoffrey M. (1 June 2014). "Menthol enhances phasic and tonic GABAA receptor-mediated currents in midbrain periaqueductal grey neurons". Br. J. Pharmacol. 171 (11): 2803–2813. doi:10.1111/bph.12602. ISSN 1476-5381. PMC 4243856. PMID 24460753. ^ Watt, Erin E.; Betts, Brooke A.; Kotey, Francesca O.; Humbert, Danielle J.; Griffith, Theanne N.; Kelly, Elizabeth W.; Veneskey, Kelley C.; Gill, Nikhila; Rowan, Kathleen C. (20 August 2008). "Menthol shares general anesthetic activity and sites of action on the GABAA receptor with the intravenous agent, propofol". Eur. J. Pharmacol. 590 (1–3): 120–126. doi:10.1016/j.ejphar.2008.06.003. ISSN 0014-2999. PMID 18593637. ^ Freires, I. A.; Denny, C.; Benso, B.; de Alencar, S. M.; Rosalen, P. L. (22 April 2015). "Antibacterial Activity of Essential Oils and Their Isolated Constituents against Cariogenic Bacteria: A Systematic Review". Molecules. 20 (4): 7329–7358. doi:10.3390/molecules20047329. PMC 6272492. PMID 25911964. ^ PDR for Herbal Medicines (4th ed.). Thomson Healthcare. 2007. p. 640. ISBN 978-1-56363-678-3. ^ a b Croteau, R. B.; Davis, E. M.; Ringer, K. L.; Wildung, M. R. (December 2005). "(−)-Menthol biosynthesis and molecular genetics". Naturwissenschaften. 92 (12): 562–577. Bibcode:2005NW.....92..562C. doi:10.1007/s00114-005-0055-0. PMID 16292524. ^ "Japan: Takasago to Expand L-Menthol Production in Iwata Plant". Flex News Food. ^ Schäfer, Bernd (2013). "Menthol". Chemie in Unserer Zeit. 47 (3): 174–182. doi:10.1002/ciuz.201300599. ^ Henderson, B. J.; Wall, T. R.; Henley, B. M.; Kim, C. H.; Nichols, W. A.; Moaddel, R.; Xiao, C.; Lester, H. A. (2016). "Menthol Alone Upregulates Midbrain nAChRs, Alters nAChR Subtype Stoichiometry, Alters Dopamine Neuron Firing Frequency, and Prevents Nicotine Reward". J. Neurosci. 36 (10): 2957–2974. doi:10.1523/JNEUROSCI.4194-15.2016. PMC 4783498. PMID 26961950. ^ Biswas, L.; Harrison, E.; Gong, Y.; Avusula, R.; Lee, J.; Zhang, M.; Rousselle, T.; Lage, J.; Liu, X. (2016). "Enhancing effect of menthol on nicotine self-administration in rats". Psychopharmacology. 233 (18): 3417–3427. doi:10.1007/s00213-016-4391-x. PMC 4990499. PMID 27473365. ^ Wickham, R. J. (2015). "How Menthol Alters Tobacco-Smoking Behavior: A Biological Perspective". Yale J. Biol. Med. 88 (3): 279–287. PMC 4553648. PMID 26339211. ^ Hiki, N.; Kaminishi, M.; Hasunuma, T.; Nakamura, M.; Nomura, S.; Yahagi, N.; Tajiri, H.; Suzuki, H. (2011). "A Phase I Study Evaluating Tolerability, Pharmacokinetics, and Preliminary Efficacy of L-Menthol in Upper Gastrointestinal Endoscopy". Clin. Pharmacol. Therapeu. 90 (2): 221–228. doi:10.1038/clpt.2011.110. PMID 21544078. ^ Adversoriorum varii argumentii. 1. Leiden. 1771. p. 99. ^ Oppenheim, A. (1862). "On the camphor of peppermint". J. Chem. Soc. 15: 24. doi:10.1039/JS8621500024. ^ Beckett, G. H.; Alder Wright, C. R. (1876). "Isomeric terpenes and their derivatives (Part V)". J. Chem. Soc. 29: 1. doi:10.1039/JS8762900001. ^ Moriya, M. (1881). "Contributions from the Laboratory of the University of Tôkiô, Japan. No. IV. On menthol or peppermint camphor". J. Chem. Soc., Trans. 39: 77. doi:10.1039/CT8813900077. ^ Atkinson, R. W.; Yoshida, H. (1882). "On peppermint camphor (menthol) and some of its derivatives". J. Chem. Soc., Trans. 41: 49. doi:10.1039/CT8824100049. ^ Therapeutic Goods Administration (1999). "Approved Terminology for Medicines" (PDF). Retrieved 29 June 2009. ^ "Japanese Pharmacopoeia". Retrieved 29 June 2009. ^ Sigma Aldrich. "DL-Menthol". Retrieved 29 June 2009. Turner, E. E.; Harris, M. M. (1952). Organic Chemistry. London: Longmans, Green & Co.
Handbook of Chemistry and Physics (71st ed.). Ann Arbor, MI: CRC Press. 1990. The Merck Index (7th ed.). Rahway, NJ: Merck & Co. 1960. Wikimedia Commons has media related to Menthol. Colacot, T. J. (1 April 2002). "2001 Nobel Prize in Chemistry: Timely recognition for rhodium, ruthenium and osmium-catalysed chiral reactions". Platinum Metals Rev. 46 (2): 82–83.